What is the greatest risk encountered by those who work in our woods in the warm weather months? Getting hit by a falling tree? Getting attacked by a bear? Getting trampled by a moose? While any of the above could be truly traumatic, such incidents are thankfully quite rare. The greatest danger faced by members of the forest community is getting bit by the black-legged deer tick. More than 300,000 people in the U.S. contract Lyme disease every year, primarily in the Northeast, and Lyme disease is primarily transmitted by ticks. Lyme disease can cause major illnesses and even result in total disability or even death. Everybody in forestry knows someone who has had a bad case of Lyme disease. 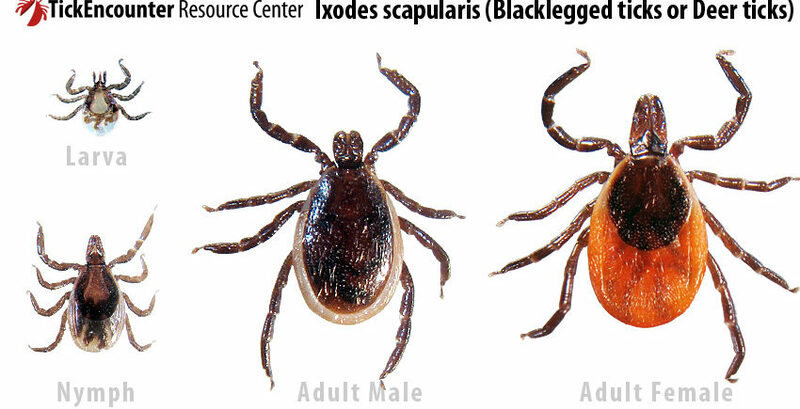 And ticks are much more common that they were 10 or 20 years ago, a symptom perhaps of our warming temperatures. Ticks like moist warm environments and our woods provide perhaps habitat for ticks. From the time the snow shrinks in late winter or spring until mid summer, it seems like there are ticks everywhere these days. To prevent tick bites, we need to take adequate precautions. Wear long sleeved shirts, boots and long pants when in the woods in the warm weather months. Treat your clothing and boots with permethrin. Put a tick repellent like picardin or insecticides with DEET on exposed skin. Most of all, carefully check for ticks anytime you come in from the woods. If you discover a tick, remove it carefully with tweezers and dispose of it. Watch for signs that you’ve been bit and been infected and get treatment quickly.